Today from the the reptile world, we have a very nice example of evolution in progress, or at least in a state of dynamic equilibrium between two characteristics, each of which could be advantageous in different circumstances. 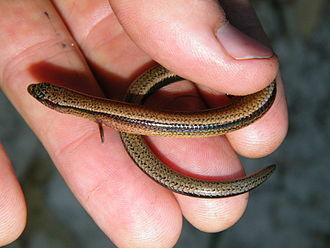 This example is an Australian skink which appears to be so finely balanced between egg-laying (oviparous) and live-young bearing (viviparous), that one individual has been observed doing both in the same pregnancy. Several weeks after laying a batch of three eggs, an individual three-toed skink, Saiphos equalis, was seen to give birth to a live young. . . .
. . . . “Even though I still had my small bubble around me, we were what Christian artists would call playing crossover venues,” he told “The Lonely Hour.” “We were out there playing bars and meeting people all over the country that my parents warned me about or that the church cursed. I’m becoming friends with them and I’m having these beautiful, wonderful experiences with them. So I started to question my religion: Is this what they were worried about? Like, just normal people? That definitely started to challenge my long-held beliefs even further.” . . . .
Reading James’ story made me wish I had never given up music lessons so I, too, could have been in a band and learned lessons far sooner than I did. There’s also a link to the audio interview with James. Just an image here. Go to the post on the “untold story” or John Loftus’s site for the video. “We can’t be certain how the Arabs became Muslim”, says researcher Tom Holland. Fascinating! Was Mohammad (“the Praised One”) originally Jesus? Was Islam originally a non-trinitarian Christian sect that rejected the need for an atonement on the cross? The evidence from coins don’t lie. People do. This is extremely interesting and new to me. Makes sense. The first video is by the Atheistic Republic, who got me thinking. The others back it up. Come on, John. Keep up. This is the first of several posts that will review Dr. Detering’s life and scholarship according to the available material on- and offline. It is carried out from afar and in an admittedly impromptu manner. I invite readers to add data, links, or corrections—simply send me an email with the information and I will consider adding it to the CV. The Wikipedia article (German here) is a good place to begin, and Detering’s own brief VITA in German is on his website here. These posts are deceptively short. However, they are dense with links that offer the interested reader avenues to explore a good deal of material. If possible, I would like to add a personal impression of Dr. Detering’s character, work, and family life. Any reader who knew Hermann personally, and for some length of time, is invited to email me his/her impressions which I will review and certainly consider uploading. Oh no, from Salon.com, some frightening news! Won’t Trump see their support as enough reason to change his mind and go back into Syria in force?!! Why can’t they just stay quiet and make him think they oppose him on everything? Posted on 2019-04-03 23:35:08 GMT+0000 by Neil Godfrey. This entry was posted in Uncategorized. Bookmark the permalink. I favor the move by AOC and Omar. It shows that they are focused on policy, not partisanship. I think its welcome. I’m not sure whether withdrawal from Syria is actually good policy, or if it is even actually going to happen, but I think its good that they are supporting it if they think its good policy, regardless of whether it’s being done by Trump. why all the early inscriptions transcribe the name muhammad and never translate it ? wouldn’t this imply muhammad was a proper name? so whats going on ? Before we get to the question of “was Muhammad real” we have to get to the question of, “where did the Koran come from”? I think what’s clear is that the Muhammad of legend certainly wasn’t real. Did anyone named Muhammad have anything to do with the origins of the Koran? That’s a more pertinent question I think. I haven’t studied the Koran enough to really provide good analysis of it, but from what little I’ve learned of it, it seems to be a compilation of Hellenistic and Arab works from many different sources. I suspect that the Koran may have been commissioned in order to bring together some disparate groups and unite them in opposition to Western Roman rule. It seems that Islam was born out of the expulsion of heretical Christians, Jews, and pagans from the Western Roman empire. Islam comes on the scene shortly after the Western empire was consolidated under Christian rule and significant pogroms against non-Catholics began. This forced many non-Catholics out to the east, who brought with them heretical Christian, Jewish and “pagan” works. What we find in the Koran are several references to ideas that had been deemed heretical by the Catholics, including some ideas from Aristotle, etc. and various concepts from Greek science that had been denounced by the Catholics. So certainly a lot of Greek and Roman knowledge and philosophical concepts that had been ruled heretical by the Catholics got preserved by Muslims. In this sense, it is appropriate to view Islam as a more enlightened version of Christianity that was more inclusive of a broader range of philosophic concepts than Catholicism was. Did any of this have anything to do with Muhammad? It doesn’t seem so. It seems that Muhammad was either a later invented founder figure or an tangential ruler or warlord who may have had some roll in uniting some Arab tribes around this time that later Muslims tried to hitch their wagon to. One irony of Islam, IMO, is that it is more reasonable and believable than Christianity in many ways, which has led to more fervent adoption of it. In other words, it’s not so absurd that so many people have doubted and rejected it like has happened with Christianity. Yet, it’s really still just another bunch of ancient fables and archaic ideas. I suspect that the Koran may have been commissioned in order to bring together some disparate groups and unite them in opposition to Western Roman rule. It seems that Islam was born out of the expulsion of heretical Christians, Jews, and pagans from the Western Roman empire. Islam comes on the scene shortly after the Western empire was consolidated under Christian rule and significant pogroms against non-Catholics began. I think we would do well to rethink and re-characterize ‘Western ‘Roman’ and the Christian church as being ‘Catholic’ before the 8th or 9th century a.d. because the western empire had collapsed by the mid 280s a.d and ‘Rome’ had been moved around – mostly in the east – before being established as Nova Roma (Νέα, δευτέρα Ῥώμη) in what had been known as Byzantium and became known as Constantinople after Constantine I’s death. The eastern Roman empire became the Byzantine empire by the end of the 4th century while the western Roman empire languished and essentially folded. Christianity is likely to have been mostly eastern [orthodox] at the time Islam was spawned. I’m not sure if Christianity was Catholic or much Catholic before the collapse of the Byzantine empire. • Per “Darwin-Doubters”, first establish that an intelligible dialogue on microevolution is possible. Macroevolution and microevolution describe fundamentally identical processes on different time scales. Microevolution refers to small evolutionary changes (typically described as changes in allele frequencies) within a species or population. while macroevolution is evolution on a scale of separated gene pools. Macroevolutionary studies focus on change that occurs at or above the level of species. In young Earth creationism and baraminology a central tenet is that evolution can explain diversity in a limited number of created kinds which can interbreed (which they call “microevolution”) while the formation of new “kinds” (which they call “macroevolution”) is impossible. This acceptance of “microevolution” only within a “kind” is also typical of old Earth creationism. Cline, Austin (27 March 2019). “The Difference Between Microevolution and Macroevolution”. ThoughtCo. If you find a creationist arguing that microevolution can occur but macroevolution cannot, simply ask them what biological or logical barriers prevent the former from becoming the latter–and listen to the silence. Writing this was actually one of the things that put me on the road to writing about Jesus historicity, and I’m still trying to get back to publishing a revised and improved version of this and tying it all back in to a mythicst understanding of Christian origins. • There is a convergence on evolution and a divergence on Jesus ahistoricty theory between R. G. Price and Jonathan Tweet, which perhaps may be interesting in some way viz.”Tribal Atheism”. see: “Jonathan Tweet”. Wikipedia. “TIES Webinar: Jonathan Tweet, author of Grandmother Fish”. YouTube. Richard Dawkins Foundation for Reason & Science. 13 August 2018. “Historical Jesus Debate”. YouTube. Seattle Atheists. 9 October 2017. What Should Atheists Conclude about the Existence of Jesus?” That’s our topic. Richard Carrier is the world’s leading doubter of the historical Jesus. Jonathan Tweet is a Seattle-area atheist and amateur Jesus scholar. The suggestion that there is “no evidence” is a lie – primary point – a simple search can find much evidence. The next step is to see how the evidence is being interpreted and re-interpreted. Another useful step is to see motive of the Arab conquests and how or why they were successful in their campaigns. Nothing like zeal and religious conviction can rally people to invade and conquer. The more mainstream non-Islamic sources actually attempt to indicate the Prophet Muhammad (SAW) to have been alive during the Arab conquests – the idea by Tom Holland has been extended further. The attempt to reframe Islamic Muslim version of history was to infer Muhammad (SAW) was personally involved in the campaigns, the new narrative is that Arabs did the conquests and designed Islam as an afterthought. Whereas the Muslim idea is that the Caliphs were responsible and were taking the message forward only. The events in the above link need to be thoroughly investigated in my opinion. Specifcially any document that conflicts with the official version and is as old as it. Since both worlds were involved Christian and Muslim documents should be in place to reflect this event. Clear evidence of 7th century hijri date? Evidence that Arabic in pre-Islamic times is rare, but not non-existent since the very birth of Islam. It’s records do not start in the 800s as suggested. Entertaining the Holland argument we need to further in infer that alongside an Arab conquest without a clear motive to spread there was also a fast paced growth of Arabic writing all of which comes before the religion!? – They don’t see that as a sign of the new found religion and purpose and direction – which is quite strange coming from a historian. I’m going to look in to this ‘coin’ argument too. I saw the video and to me it seemed like I was reading the name Muhammad on the coin. But I need a clear photo to cross-examine. The assertion that it says “real” on the coin needs to be looked in to. I highly doubt it – because it was not suggested where or why that term is stated on the coin and I have other theories too such as re-minted coins … That is when the Muslims conquered the regions they kept the coinage as before but restamped or over-stamped them – but I need to look in to this further. I won’t spend too much time on this though as this is not my area of interest, but as a Muslim I feel I should do my bit to critique the theory. Nothing like zeal and religious conviction can rally people to invade and conquer. That’s utter nonsense. You obviously have not even taken the trouble to examine the evidence and arguments on both sides of the question. Have you taken the trouble to actually examine the arguments that you seem to think all your links nullify? You lost me with your very first one, the Teaching of Jacob link. Can you explain how that particular document undermines the argument you seem to assume it does? Please examine the arguments before just swiping off assertions from here and there on the web on the assumption that they hold all the answers you think will satisfy your views and demolish arguments you have not even bothered to examine. I was not really giving an academic or detailed response – but it was more of a reaction – a posted points that can be developed to arguments against the notion. You are totally right that I have not addressed specifics and although I didn’t intend to go into this deeply I guess I have to at least give it the attention it deserves. I consider it a challenge and hopefully can exercise some skills that I have learnt from you and others who frequent this site. A quick update – I’ve been well diverted from my actual area of interest, however, this is great stuff. I can now tie in to this area too. Initial conclusions: I acknowledge that I was quite hasty – there is a lot of interesting information regarding Arabs who were Christian and Jewish pre-Islam, however I’m drawing different conclusions of their presence and role in the early Islamic empire. I’ve already found some areas of clear contrast from the above narrative that I can hint on but I will elaborate on hopefully later. There were Arabic Christians around in Syria – but when the Muslim army invaded at the time of Abdul Malik, the settlers brought a new mix – then there were indeginous Arab Christians a form of Trinitarians and coloniser Arab Muslims from the south in smaller numbers. I’ll back this notion up in future posts. There may have been others too Nabateans and Aramains who had a sort of unitarian Christianity or Messianic Judaism. Yet there is also some reason to believe that what we call “Muslim” at that time was very inchoate, scarcely recognizable as Muslim compared with the religion that we find clearly established quite some time after those conquests.